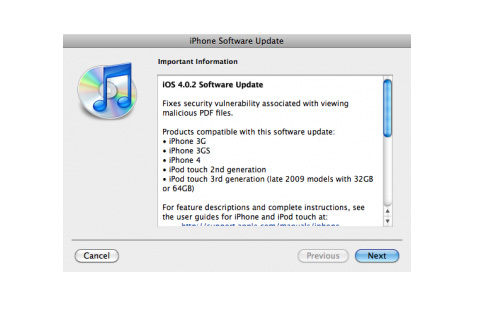 Apple has released iOS 4.0.2 for the iPhone and iOS 3.2.2 for the iPad to fix the famous PDF security glitch behind the successful jailbreaking of the iPhone 4. Users have reported receiving the update which is a big one with 579.3 MB on iPhone 4 which indicates a lot more than just a security patch. The serious security hole became a headline after the impressive jailbreak and unlock for the new iPhone was released and Apple engineers realised the threat which was serious enough to destroy the devices if users only opened a malicious PDF file. If you’re an iPhone user and have unlocked and jailbroken your smartphone, you should know that installing the update will mean losing both and all other un authorised modifications you may have. So, if you want to keep your jailbreak and unlock, ignore the update but if you prefer security, it is advisable to hit the install button.